As the leading literary figure to emerge from post-World War II Europe, Samuel Beckett's texts and his literary and intellectual legacy have yet to be fully appreciated by critics and scholars. The goal of New Interpretations of Beckett in the Twenty-First Century is to stimulate new approaches and develop fresh perspectives on Beckett, his texts, and his legacy. The series will provide a forum for original and interdisciplinary interpretations concerning any aspect of Beckett's work or his influence upon subsequent writers, artists, and thinkers. Jennifer M. Jeffers is a Professor of English at Cleveland State University. In addition to numerous articles, she is the author of The Irish Novel at the End of the Twentieth Century: Gender, Bodies, and Power; Britain Colonized: Hollywood's Appropriation of British Literature; Uncharted Space: The End of Narrative, the editor of Samuel Beckett, and co-editor of Contextualizing Aesthetics: From Plato to Lyotard. 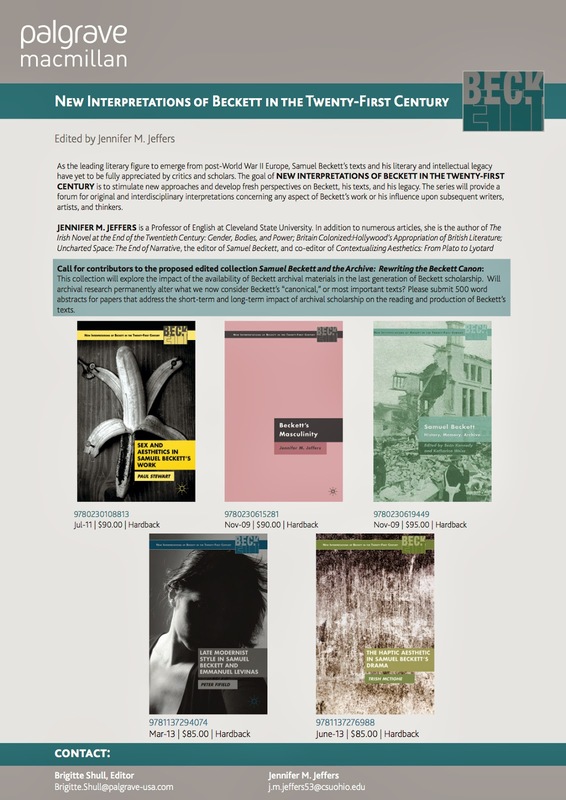 This collection will explore the impact of the availability of Beckett archival materials in the last generation of Beckett scholarship. Will archival research permanently alter what we now consider Beckett's "canonical," or most important texts? Please submit 500 word abstracts for papers that address the short-term and long-term impact of archival scholarship on the reading and production of Beckett's texts.